The most awaited movie premiere of the year is Steven Spielberg’s War Horse opening on Christmas Day December 25 in the US and on January 13, 2012 in the UK. 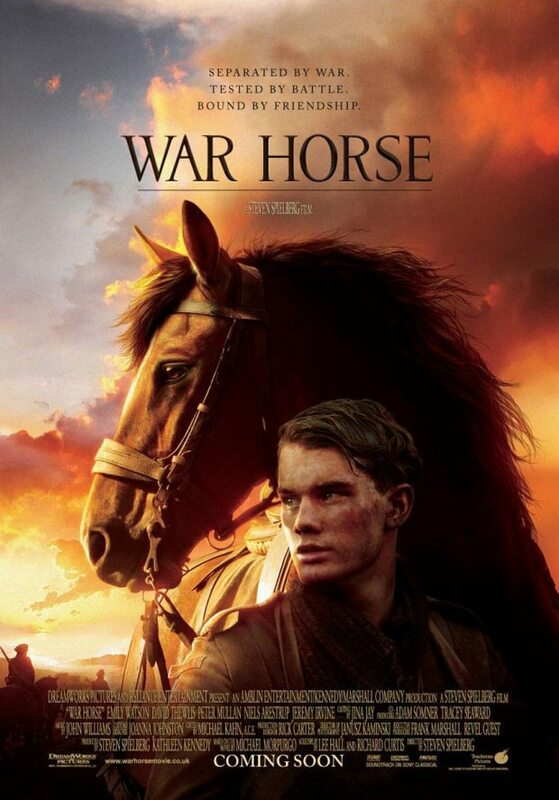 War Horse is an adaptation of British author Michael Morpurgo’s children’s novel set during World War I. The novel was first published in 1982 and had a successful stage adaptation in 2007. Spielberg said he had challenges in reworking “a beloved Broadway play into a big screen moment to remember”. War Horse is the second Steven Spielberg film opening this December in the US. The first The Adventures of Tintin was released yesterday Wednesday December 21, 2011 in Digital 3D and IMAX. The Adventures of Tintin is Spielberg’s first foray into motion-capture filmmaking as well as 3-D.
“Tintin,” is the famous comic hero created by the Belgian artist named Hergé in the late 1920s. Tintin is a young daring investigative reporter whose travels around the world exposes him to fantastic adventures as he covers big stories and uncovers even larger mysteries accompanied by his dog, Snowy. I am really excited to see how War Horse will fare at the box office. Will it set a new box office record? This entry was posted in Featured, News, World by admin. Bookmark the permalink.